The apparent burning of captured Jordanian pilot Moaz al-Kasasbeh should be treated with suspicion, as his death has all the signs of being a choreographed event. Along with other high-profile ISIS killings, the ‘fiery death’ of Kasasbeh, appeared to depict a very stylized affair, one with multiple camera angles, modern Hollywood-like editing, all packaged in a gripping social media campaign, complete with ISIS members being clothed in pristine military-issued outfits, holding weapons that look as though they’re props and have never been fired. While on an airstrike mission on December 24th, Moaz al-Kasasbeh apparently crashed his plane in the city of Raqqa, Syria, after conflicting reports as to how his plane was downed according to Jordanian officials. The Jordanian pilot is said to have met his end due to a failed swap of Sajida Mubarak Atrous al-Rishawi, who was convicted in the suicide bombings at the Grand Hyatt Hotel, Radisson SAS Hotel and the Days Inn in Amman, Jordan in 2005. The attacks claimed 60 lives, injuring over a hundred at all three locations. During the time, CNN stated many expressed doubt over al-Rishawi’s involvement in the suicide bombing plot in a report from November of 2005. The apparent jihadist al-Rishawi, along with one other were promptly executed by the Jordanian government in retaliation for the burned pilot. 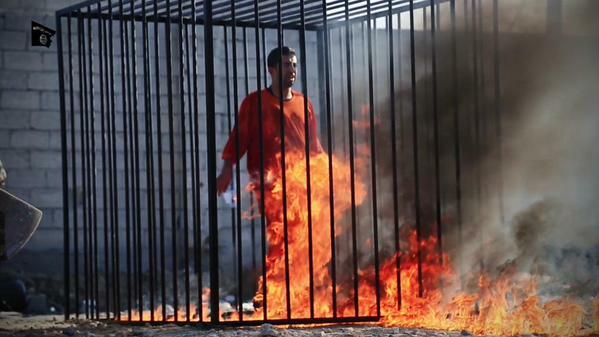 Jordanian pilot Kasasbeh was held captive by ISIS militants before being allegedly burned alive on January 3rd. Then, exactly one month later the news of Kasasbeh’s ‘death by fire’ was released through social media channels. Kasasbeh’s tale is a harrowing one for sure – but a story which could very easily be used to disguise the culpability of the US government in the rise of masked Sunni extremists and in particular, the clandestine training facilities said to be located in both Turkey and Jordan that have ties to ISIS. There was a very real shift pull public perception over countries dealing with the new ISIS firebrand. Once again the timing and predictable reaction regarding the seemingly inconclusive fire based video appears to fall in line with other botched beheading’s by ISIS – continuing the designer terror threat for a larger Western agenda. According to reports, a 22-minute video depicted Kasasbeh walking at gunpoint into cage, at which point was set on fire once inside the cage via powdered explosive. As with nearly all ISIS videos, this latest video was pulled from social media platforms in under 24 hours, just long enough for a specific message to sink in, so as to avoid scrutiny over the highly produced video. Jihadi John, the masked militant seen in six propaganda videos before, was noticeably absent from this latest video production with Jordanian pilot Kasasbeh. The video was a flashy quick edit MTV-style production titled “Healing of the Believers’ Chests,” which was said to have been released through social media on February 3rd. However, Jordanian officials revealed that Kasasbeh was killed on January 3rd – something which will prove to be a bit of a quandary for US authorities, Jordan and SITE, as they try to explain how this was already known for one month. US media outlets quickly sprung into action, glossing over the broken timeline as a mere ‘insignificant detail’. Another question to consider: Why would ISIS militants wait to disclose the death of Jordanian pilot Kasasbeh for a whole month, as they regularly dispense their propaganda at will – with little regard to apparent victims or Western nations? Back in September, many independent experts examined the alleged brutal beheading’s of both James Foley and Steven Sotloff which were believed to have shown elements of camera trickery and post-production. “Forensic analysis of the footage of the journalist’s death has suggested that the British jihadist in the film may have been the frontman rather than the killer. The recent beheading’s of Japanese journalist Kenji Goto and fellow captive Haruna Yukawa, displayed much of the same diabolical media trickery we saw in most other ISIS executions. The stark difference appears to be that the scene looked to be shot on location similar to the apparent burning of Kasasbeh, without the assistance of a sound stage or green screens which were used in previous beheading videos. However, the whole episode turned into a complete media farce with an egregious extortion plot, when ISIS pirates demanded $200 million dollars for the two Japanese men. The report may have unintentionally disclosed that many Jordanian’s are not in support of the West’s fraudulent war-theater in Iraq and Syria, and that some of these new ISIS events may not be sanctioned by their own proclaimed terror leaders. This then begs the question: who is releasing material on behalf of the group, if it is not sanctioned by ISIS leadership? There are so many unanswered forensic questions surrounding the ISIS executions, and even a basic assessment of an alleged death has yet to be proven forensically. In March of 2013, Germany’s Der Spiegel, along with Britain’s Guardian outlet, revealed that the “US had been training Syrian anti-government fighters in Jordan,” while receiving additional support from other Western allies, including their valued partners within the Gulf Cooperation Council (GCC). In addition to the typical Western cohorts getting in on the act, it was revealed that Jordan was also culpable, as Jordanian intelligence services were said to be involved in the program, aimed to build, “a dozen units totaling some 10,000 fighters,” within the FSA facility in Jordan. The Spiegel report also stated that the US Defense Department declined to comment, along with the French foreign ministry and Britain’s foreign and defense ministries. In 2012, at the height of the ‘chemical weapons’ allegations swiriling in Syria, a chain of events was revealed that exposed the connection between FSA rebels, ISIS and the Turkish guided rebel paramilitary group Front Victory. Front Victory had experience using chlorine as a chemical weapon and many of the groups founders came out of ISIS – who were first installed in Syria in 2011. As we’ve covered before here at 21WIRE, human rights investigator Nizar Nayouf via SyriaTruth.org, revealed that Jordanian intelligence services had a much greater role in the in the growth of the ISIS. In 2002, Rita Katz and Josh Devon founded Search for International Terrorist Entities (SITE) Institute, which eventually developed into its current incarnation, as a propaganda outlet for high-profile terror groups. “Katz has a testy relationship with the government, sometimes acting as a consultant and sometimes as an antagonist. About a year ago, a SITE staffer, under an alias, managed to join an exclusive jihadist message board that, among other things, served as a debarkation point for many would-be suicide bombers. For months, the staffer pretended to be one of the jihadis, joining in chats and watching as other members posted the chilling messages known as “wills,” the final sign-offs before martyrdom. The staffer also passed along technical advice on how to keep the message board going. How does SITE avoid any potential charges related to their organization, given that they’ve admitted to providing advice to those plotting potential attacks? Perhaps there is a better explanation. Why would ISIS care to go through the intelligence group, when they could just as easily upload videos to a plethora of other social media platforms on their own? Additionally, if SITE knows the alleged location where ‘terror videos’ are being uploaded as stated by Katz in the CNN interview above, why wouldn’t the US government be able to track and find those involved in producing such terror? The apparent ISIS ‘executions’ have been used by Western media to sway public opinion, preemptively prepping the public for future western-backed war theater. Site appears to have garnered exclusive ‘publishing rights’ to the video deeds of various terror puppets like al Qaeda, Boko Haram, al Shabaab, and now ISIS. After Jordanian authorities quickly moved to execute several purported militants in retaliation, like clockwork an airstrike campaign quickly ensued. 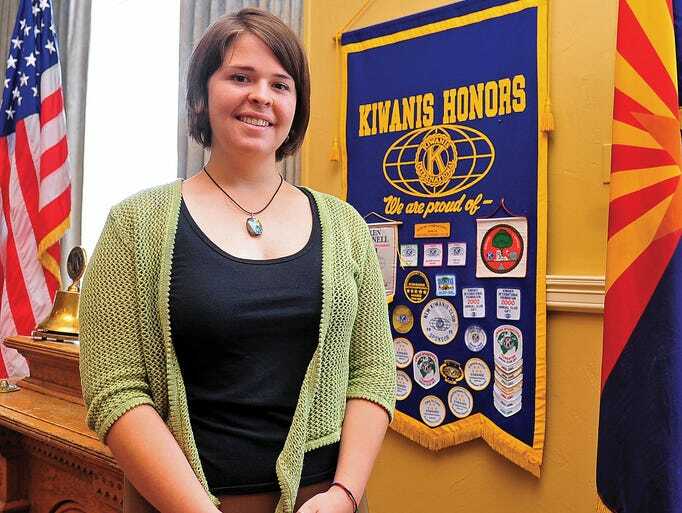 A 26-year-old American aid worker Kayla Jean Mueller of Prescott, Arizona was allegedly taken hostage by ISIS, while working with Médecins Sans Frontières aka ‘Doctors Without Borders’ (MSF) in August of 2013 in Aleppo, Syria – well before Washington and US media began marketing the ‘ISIS’ terror brand. For reasons unknown to the public, her identity was heavily guarded until recently. Oddly, there were no candlelight vigils, not calls for her release, and almost zero media coverage of Kayla’s supposed ‘kidnapping plight’ in either local or national US media until after the Paris Shooting story was pulled out the news cycle in late January 2015. Coincidentally, Arizona Senator John McCain was in the exact same area where Mueller was allegedly working – at roughly the same time in May 2013, when McCain himself had sneaked into Northern Syria via Turkey, to meet with what he claimed to be ‘rebels’ but who we now know were in fact terrorist fighters and privateers. Interestingly, MSF was the NGO who had also sneaked into Syria and pre-positioned itself in the exact area of Ghouta, outside of Damascus – just prior to the failed False Flag Chemical Weapons Attack on August 21, 2013 – an event which Washington and London hoped to blame on the Syrian government but was later proven to be the work of John McCain’s own US-backed ‘rebels’. WSWS confirmed: “The group [MSF] was well aware that their prominent announcement of chemical weapons deaths would be immediately seized upon by the Obama administration to claim that Syrian President Assad had crossed the “red line” and to stoke the drive for war. And it was . At the time, the MSF was admittedly working “under the auspices” of US-backed anti-Assad militias. Several days later, the group back-tracked, issuing another statement to the effect that they couldn’t know the source of the neurotoxin involved in the purported gassings. But the impact of its August 24th statement remained. In fact, the US Center for Strategic & International Studies approvingly noted that the MSF made a “risky, tough call” in issuing an immediate pronouncement, particularly since MSF doctors were not even present at the scene. A month after the fact, the New York Times belatedly mentioned that doctors are often “notoriously wrong” when assessing chemical weapons injuries. Most recently, journalist Seymour Hersh has demonstrated that the US government and President Barack Obama were knowingly lying when they claimed that the Syrian government had carried out the sarin gas attack last August (See: “Seymour Hersh exposes US government lies on Syrian sarin attack”).”In addition, aid worker Mueller, was said to have worked with humanitarian aid groups in Darfur, Sudan, Northern India, Israel and Palestine. Given the fact the that many aid groups have been connected to intelligence operations, we have to consider the possibility that Mueller’s case is connected to western intelligence agency work as well. US authorities have been scrambling to confirm whether or not the young aid worker was killed from airstrikes carried out by the Jordanian Airforce, following the apparent execution of their pilot Kasasbeh. According to SITE Intelligence Group, ISIS disclosed that the death of Mueller was caused by the Jordanian airstrike campaign via a social media account on Twitter. The timing of the Jordanian pilot incident and the apparent airstrikes which followed seemed to be choreographed with that of Jordanian King Abdullah’s visit to the White House. Reuters announced yesterday that Jordan has carried out 3rd day of air strikes, as a US-led coalition has conducted 11 air strikes in Syria and 15 in Iraq over the past 24 hours. How much longer can those in Washington and SITE continue the ISIS charade before there is a mass public awakening to the decidedly Western propaganda? Look for several other possible plots against Jordanian pilots and a British journalist said to be captured by ISIS in the coming days and weeks.